SUVs used to have a poor reputation for safety. They were built on truck-based frames that were top-heavy, took longer to stop when braking, had weak handling, and were prone to rollovers. Rollover accidents have high fatality rates in relation to other types of accidents. Things reached a peak when in the year 2000 the U.S. National Highway Traffic Safety Administration contacted Ford and Firestone about high incidence of tire failure on Ford Explorers, Mercury Mountaineers, and Mazda Navajos fitted with Firestone tires. Ford investigated and found high tire failure rates and rollover accidents in models equipped with 15” Firestone ATX, ATXII, and Wilderness AT tires. There was subsequently significant litigation involving Ford and Firestone and victims of rollover accidents. The negative publicity negatively impacted Explorer sales and it lost its reign as the best selling SUV. In the past decade, the SUV landscape has significantly changed. 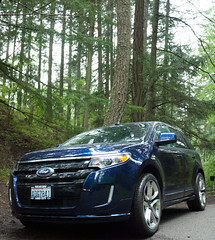 SUVs have become increasingly more car-like as crossovers have flourished. 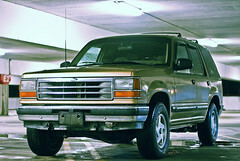 Even the Ford Explorer no longer uses a truck-based architecture. The transition to car-based platforms has lowered the vehicles center of gravity and improved handling. This combined with new technologies such as ABS, traction control, and electronic stability control has significantly improved SUV safety. Electronic stability control has significantly contributed to reducing SUV rollover rates. In fact, according to a recent Insurance Institute for Highway Safety (IIHS) SUV drivers are among those who are most likely to survive an accident. The Ford Edge, Land Rover Range Rover Sport, and Land Rover Range Rover LR3 were among the winners in the survey for vehicles in which drivers are least likely to die in an accident. There were no reported fatalities in these vehicles. The next group of safest SUVs were the Honda CR-V, Jeep Grand Cherokee, and Acura MDX. The IIHS report shows that drivers of SUV are half as likely to die in an accident than drivers in cars. In the study, researchers computed driver fatality rates for all models with at least 100,000 registered vehicle years during the 2006 to 2009 calendar year period. Pick up trucks had fatality levels similar to cars. Minivans with their lower ride height but similar weight and size as SUVs were the only vehicle type to have lower fatality rates than SUVs. So are SUVs safer than cars? The answer is now yes. SUVs have always had somewhat of an advantage in safety over cars due to their greater size, weight and ride height. But rollover accidents lead to many fatalities. Now new safety technologies and the shift towards crossovers have greatly reduced rollover rates, making SUVs safer than cars. Also, thanks for using my image. SUVs may be safer for those driving them, but they are more dangerous for those they collide with. It is only because of SUVs that cars are now more dangerous. For each person who switches to driving an SUV for safety, this increases the collective danger of driving for everyone.